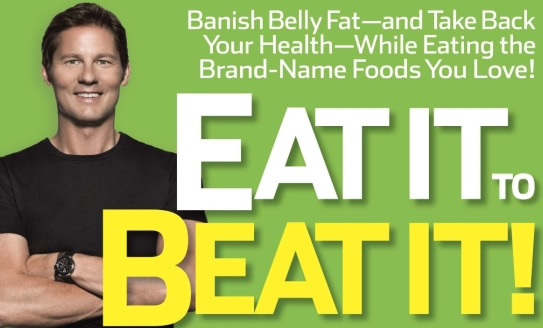 Eat It to Beat It by New York Times bestselling author, David Zinczenko, shows you how to make smart choices while eating all of the foods you love. You can even enjoy burgers, pizza, French fries and chocolate without gaining weight or destroying your health. The key is to select healthier versions of your favorite meals by following Eat It To Beat It’s guidance. First, the book reveals some of the bizarre and unhealthy ingredients in many common brand-name foods. Zinczenko also exposes the shocking amounts of hidden calories, fat and sodium in fast-food and restaurant chain meals. Eat It To Beat It offers alternative choices that are much better for your health and your waistline. Consistently following Zinczenko’s advice can help you lose weight, reduce blood pressure, and boost your immune system without counting calories. Never eat more than an entire day’s worth of calories (1800-2000), fat (65 grams) or sodium (2400 grams) in a single meal. There are actually over 1000 foods available that contain this. However the information in this book will make it easy for you to identify these items and make healthier choices. The book helps you make better choices when eating your favorite brand name foods and at your favorite restaurants. IHOP’s Chicken and Spinach Salad has the same amount of calories as 6 Klondike bars. Choose a similar salad at a different restaurant and you will save 1200 calories. Denny’s Macho Nacho Burger has 860 calories – the same amount as in six bowls of Cocoa puffs. But you can still eat at Denny’s if you choose the chicken avocado sandwich with fresh veggies, which has only 490 calories. Some brands of oatmeal contain the same amount of sugar as 13 Hershey’s Kisses. Make a healthier choice for breakfast and you can take control of your blood sugar levels. While French fries aren’t recommended as a healthy option, some are still better than others. Friendly’s Loaded Waffle Fries are topped with melted cheese, bacon, sour cream and have ranch dressing on the side. They contain 1720 calories and 119 grams of fat. A much better option would be Longhorn Steakhouse seasoned fries with just 280 calories,13 grams of fat and 135 mg sodium. Another good choice is Elevation burger fries. These are some of the only fast-food fries that contain just potatoes salt and olive oil as ingredients. Eat It To Beat It offers readers advice on how to discern which brand name foods offer the best quality nutrition and potential value for health. However, not all brands of chocolate are as healthy as they appear. The term “dark chocolate” is totally unregulated by the FDA. As such any chocolate can be labeled dark as long as it doesn’t contain vegetable oil as an ingredient. Additionally some brands of chocolate are processed in a way that destroys up to 75 percent of the health-supporting polyphenols. Many also contain high levels of added sugars. Zinczenko recommends the best brands of chocolate and offers advice on how to discern the quality of dark chocolate. Eat It to Beat It! : Banish Belly Fat-and Take Back Your Health-While Eating the Brand-Name Foods You Love retails at $22. Makes it easy to cut calories while still enjoying your favorite foods. Explains the nutritional impact of foods on six common health concerns: weight, blood pressure, cholesterol, blood sugar, brain health, and mood. Reveals information about ingredients in brand-name and restaurant items. Includes recipes for maximizing the nutritional value of your meals. Encourages dieters to continue eating fast foods and other unhealthy options. Results may occur slowly for some individuals. Is not a complete or structured weight loss program. Eat It to Beat It reveals some of the shocking, unnecessary ingredients and high calorie levels in many common foods. It offers guidance to help you make smarter choices while still enjoying all of your favorite restaurant and brand-name items. Substituting healthier lower-calorie alternatives can help you lose weight and improve your health. However, readers should be aware that many of the recommended items are not necessarily healthy. For continued health and weight loss benefits dieters should emphasize more unprocessed, natural foods and engage in regular physical activity.